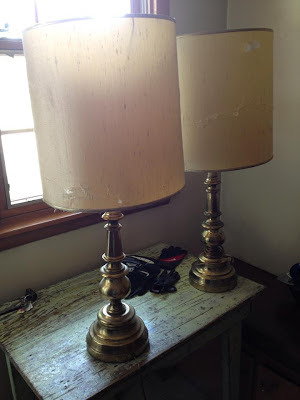 Do you remember my $1 garage sale lamps? I cleaned them up with chlorox wipes. There wasn't much I could do about the cracked shades. I went to Jo-Ann's and picked up some fabric, spray paint and trim. I had a gift card so I didn't have to spend a dime. I'm not sure what the problem was, but the spray painting didn't go very smooth. Maybe I didn't get them clean enough. I picked yellow spray paint and a white, patterned fabric with black trim. As you can see the paint wouldn't stick in some places. I'm not sure why. I did nice light coats but it always separated in those areas. The color isn't really true to the color of the cap. It came out more like a butter yellow but the cap is much more vibrant. The lamps look darker in the house. I didn't take any pictures of the process it took to get the fabric on the shade. I used spray adhesive and it was kind of a frustrating job. Unfortunately the shade is cracked and broken in places and you can see it through the fabric. I used my hot glue gun to put the black trim around the top and bottom. But not too bad for $1 spent and $15 spent on a gift card. I've only got one shade done. Now to go do the other.